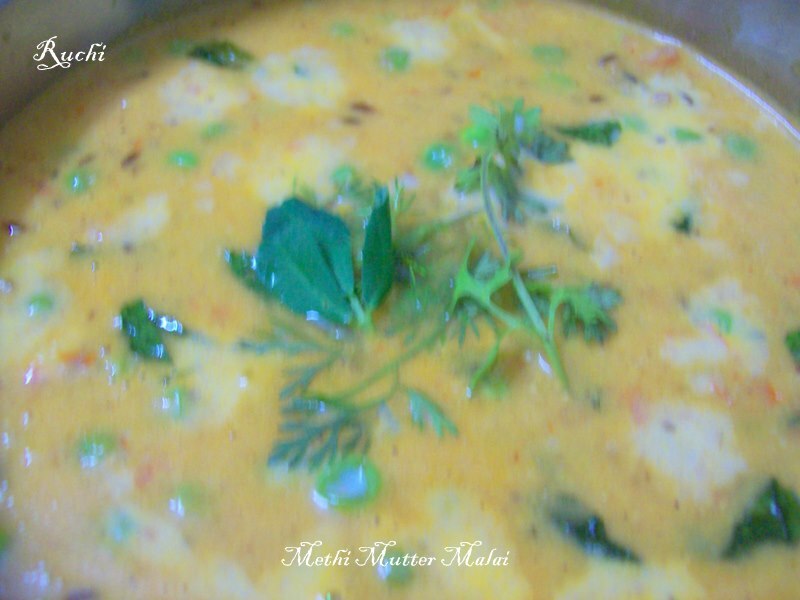 Methi Matar malai, it is a tempting quick vegetable recipe with fresh and finely chopped Fenugreek/methi leaves, peas, cream, spice powders and green coriander leaves. 1. Wash the fenugreek leaves and add ½ tsp. of salt, wait for 15 minutes and then squeeze out the water. Put the tomato in hot water for 10 minutes, remove and blend into a puree. 2. Soak cashew and poppy seeds in ¼ cup warm water and leave aside for 15 minutes. Blend these soaked ingredients with onion, green chillies, ginger, garlic to smooth paste. 4. Heat another tbsp of oil in a kadai add chopped onions and fry till golden brown. Add the masala paste and fry well till the raw aroma disappears. 5. Now add the pureed tomatoes, garam masala and fry. Add green peas, fried methi leaves, milk, sugar, salt and ¼ cup water. Cook covered till thick and saucy. 6. 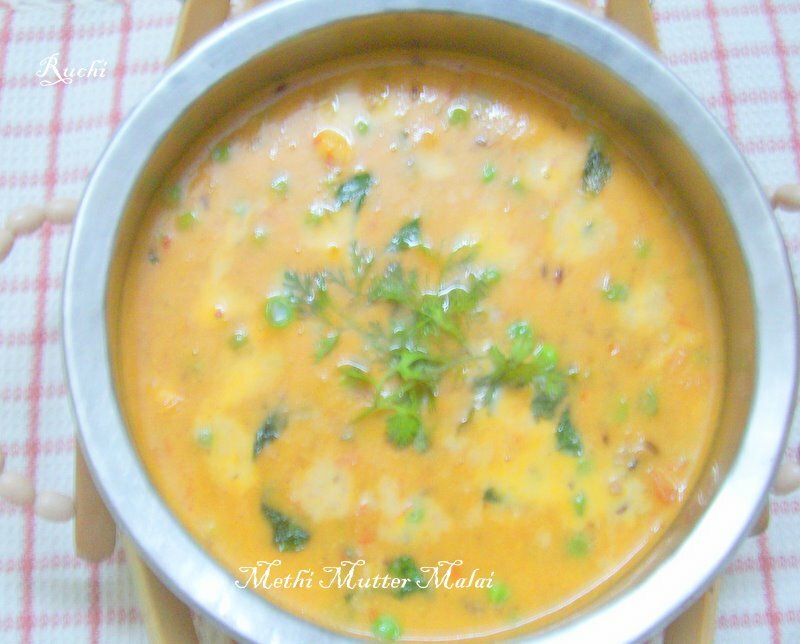 Transfer Methi-Matar Malai to serving dish and drizzle little cream on top if desired and serve hot with any Indian bread or flavored Rice and enjoy. Yummy and delicious recipe.. perfect with roti or chapathi.. thanks for the recipe dear !! looks so delicious..I have tried this and added some paneer too..looks yumm..
Wat a perfect side dish with rotis,yummy methi matar malai..